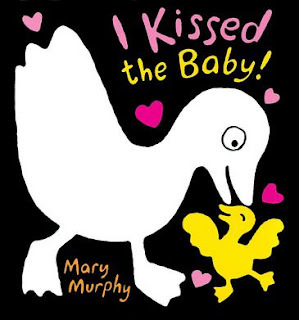 The Book Chook: Book Review, I Kissed the Baby! Book Review, I Kissed the Baby! Some picture books do double duty as a story and a game. I Kissed the Baby! by Mary Murphy and published by Walker Books (first published 2003, my edition 2011) is delightful as both. This children's picture book is very simple in both illustrations and text, making it ideal for sharing with under fives. Animals excitedly discuss seeing, tickling, singing with and feeding the baby. Mother Duck says she not only kissed the baby, she is about to do it again. And she does. Making the baby burst into a chorus of "Quackie! Quackie! Quackie!" Murphy has chosen almost stark black on white and white on black silhouettes for the animals. When we discover the baby is actually a duckling, she introduces bright yellow, and some lipstick pink kisses. My favourite page is the one where the duckling reacts to those kisses with his "Quackie!"s. Kids will very quickly learn this book by heart. Toddlers will be able to predict answers to the questions like "I sang to the baby. Did you sing to the baby?" I can just imagine all the giggles and squirms when parents act out the kissing bits on little tummies and cheeks! That's what I mean about the book being a game too - it encourages acting out and also innovation - what other things can we do with the baby? I Kissed the Baby! is a perfect read aloud for bedtime, for bath time (especially if you have a yellow ducky) and any time you need to share a story with little ones. It would also make a great mentor text for older kids who'll enjoy creating their own picture book using question and answer format, and simple silhouette pictures. I actually have this book in my classroom and my four-year-old preschoolers love it! My kids can't really read yet--some of them are emergent readers-- but they revel in pretending to be able to read a book by predicting what's going on just by looking at the pictures. This book definitely helps them achieve that. Hi thelittlebookhive! Don't you just love it when that happens. It really helps kids to engage with the text as well as the pictures if they can predict, I think. And books like this, as you say, do that so well.